SANIBEL, Fla. (December 6, 2018) -- A male gopher tortoise was admitted to the Clinic for the Rehabilitation of Wildlife (CROW) on Sunday, November 25. State officials believe it may be bigger than the current largest gopher tortoise on record. 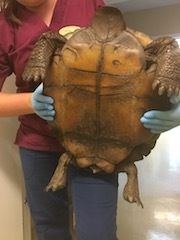 The male tortoise admitted to CROW last week tipped the scales at 15.26 kilograms and measured 44 centimeters, according to the veterinary staff. The tortoise was rescued in Koreshan State Park when rangers noticed it was acting lethargic and appeared to have diarrhea. 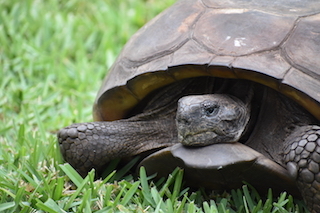 Although a tortoise’s size does not correlate directly to its age, Dr. Barron estimates the tortoise to be at least 50 years of age, possibly older. He was likely able to reach such a size, in part, due to the protected habitat where he resides within the state park. Gopher tortoises are listed as a threatened species in the state of Florida, with habitat destruction and fragmentation being a major factor that contributes to their vulnerability. 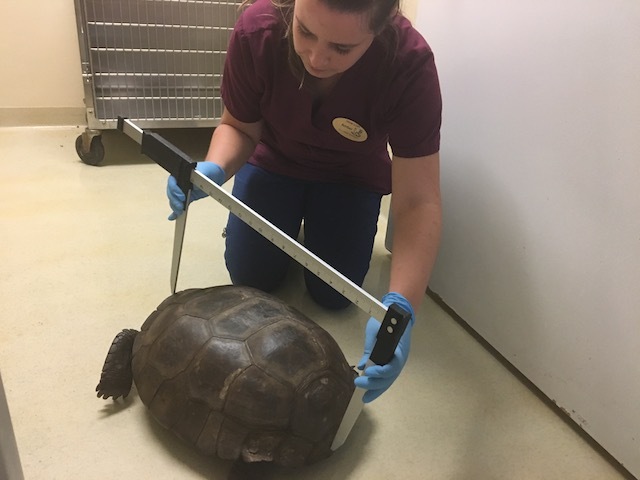 From left to right: Irwin, a Florida box turtle and CROW Education Animal, another gopher tortoise patient receiving care in the hospital and the potentially record-size tortoise patient.